(Bloomberg) -- The words are whispered under a cone of silence in moneyed Manhattan: cutthroat, ruthless, Darwinian, cruel. For New Yorkers willing to drop $50,000 on kindergarten, few rites of passage can seem as anxiety-inducing as the annual running of the toddlers. Affluent parents hire admissions whisperers, test-prep consultants and more to polish their sticky-fingered applicants. Like the Grownup Ivies -- which send out their admission decisions on Thursday -- the Baby Ivies cull the weak, interview the hopeful and decide which lucky candidates slip past the velvet rope. That puts its acceptance rate at about 10 percent, roughly the same as Cornell University’s. Trinity’s tuition, at more than $52,000 for the K-12 school, exceeds Harvard’s -- albeit without room and board. Even New York’s entry-level 1 percenters -- people who would be considered rich elsewhere –- grouse about the hefty tuition. 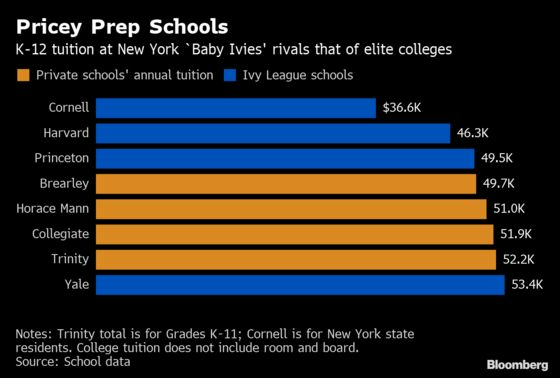 The scramble over Baby Ivies underscores the city’s wealth inequality, but not in the usual way: It represents the gap between the haves and the have-mores. 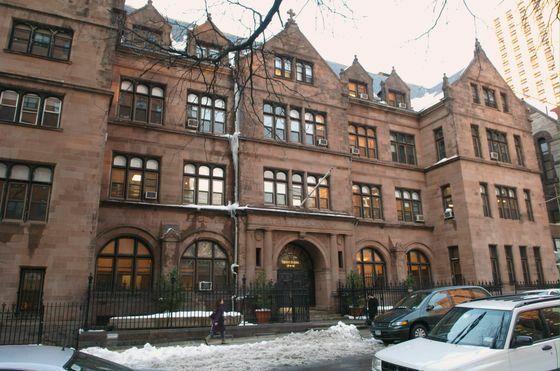 “There’s a lot of that -- trying to show off,” said Dana Haddad, founder of educational consultant New York Admissions.